If you haven’t already done so, change your eBay password. You’ll see the large banner above on the site, but they don’t make it easy to find where to do it. It’s also not the typical password changing process. 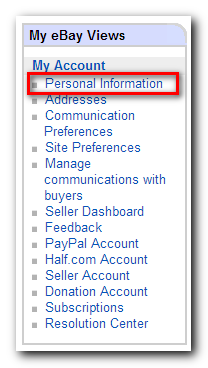 Click on Personal Information in the left menu under My Account. Click on the Edit link to the right of the Password row. Enter your eBay email address and choose to either send the password change link by email or text message (SMS). Once you get the email or text message, go back to the site and enter your new password. Many people use the same password on multiple sites. If you do this, you put yourself at risk of having all of your sites compromised if just one site has a breach. And if you have an eBay account, that just happened. The best solution is to use a unique password for every site. And each password should be long and use uppercase and lowercase letters and numbers. How are you supposed to remember one of those, let alone a dozen? You don’t have to! You just have to remember one. I highly recommend you start using a password safe. It’s like a safe in the real world. You have a tough-to-crack combination that protects your valuables (in this case, passwords). What password safe should you use? I’m glad you asked. A free browser extension as well as a web site. They do all of the encryption in the browser, which is a good thing. Their premium service costs $12/year and lets you use mobile apps too. KeePass Password Safe. It’s free, open source and runs on Windows, Linux and Macs. I store my KeePass safe in Dropbox so it’s available everywhere. I also use KeePassDroid on Android and MiniKeePass on iOS (meaning iPhone/iPad/iPod). Mac users can use this installer, which is easier to install than the default installer. LastPass is the easiest to use and KeePass works well for me. But if you’re on a Mac and you don’t mind the price, I’ve heard good things about 1Password. I only used the Windows version briefly just to test it out. A lot of people like 1Password. It originally only ran on Macs, but eventually they created a Windows version. (Unlike KeePass which started on Windows and eventually came out with a version that worked on Macs). The price is a little steep at $50 for either Mac or Windows, or $70 for both versions. The iOS version costs $18. Once you’ve set yourself with a password safe, changing a password takes a few seconds. It’s also great to have all of my login information in one secure location. And you don’t even have to type your passwords anymore. LastPass logs you in automatically and KeePass types them in for you when you hit a shortcut. In conclusion, instead of just changing your eBay password, consider changing how you store your passwords.